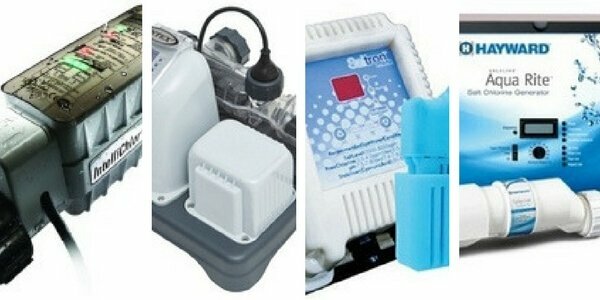 This article presents salt chlorine generator reviews for the top 4 highest selling chlorine generators in Amazon. It is intended to give an introduction to each unit and it’s features allowing the reader to get a feel of some of the most popular units on the market. The first of our salt chlorine generator reviews is on the most popular selling salt water chlorine generator in Amazon: the Pentair IntelliChlor IC40. This unit is highly regarded by the market with a 4.0 out of 5 star rating and is suitable for in-ground pools with up to 40,000 gallons of water capacity. 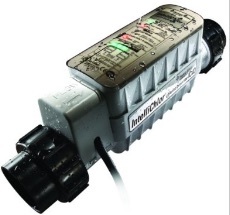 This unit features a clear and simple display panel that enables the owner to quickly check salt levels, cell condition, chlorine output and water flow warnings. Adjustment of chlorine output can be controlled using only 2 buttons and the unit even tracks the number of hours the cell has been used. There is an automatic shut-off feature should the water temperature get low enough to risk damaging the cell. The unit is installed in-line to the existing pipework and can be installed by a competent DIY’er. Please note however that this unit requires the Pentair IntelliChlor Power Center which is sold separately. The second of our salt chlorine generator reviews is on the Intex Krystal Clear Saltwater System with ECO (Electrocatalytic Oxidation). This unit is suitable for above ground pools with a water capacity of up to 15,000 gallons. 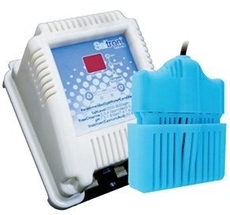 This Intex system us an affordable time saver for the pool owner that produces both chlorine and oxidants to sanitize contaminants such as bacteria and algae. The unit requires a filter pump with a flow rate between 700 and 3000 gallons per hour and is easy to install only requiring the outlet from your pump to be fitted to it’s inlet and a host from the chlorinator’s outlet returning to the pool. 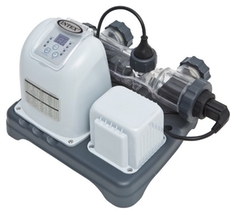 It’s very easy to use just set the number of hours per day you with to run the chlorine generator for and adjust your pump timer according to the manufacturer’s instructions and you’re good to go. This is the third highest selling salt chlorine generator review and is slightly in a different category as this unit is suited for spas or hot tubs. It’s a drop-in unit meaning that installation is a breeze and it simply hangs over the side of your spa or hot tub and sits about a foot below the water level. The unit works separately from the spa filter and pump and has a control unit with LED lights displaying the salt level status so you know if you need to add salt to the water. It features an automatic shut-off system to protect the unit and self-cleaning functionality by use of reversing polarity of the cell. The CLG20A is suitable for spas and hot tubs with a water capacity up to 2,000 gallons. 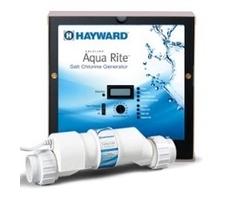 The Hayward AQR15 is promoted as one of the world’s best chlorinators and is suitable for in-ground pools with a water capacity of up to 40,000 gallons and comes with a 3-year warranty. Like most units, this one features a self cleaning function by using reverse polarity on the cell making maintenance less of a time consumer. The unit has been given a 4.7 out of 5 stars rating on Amazon by the market which is an indication of its quality. Installation is easy and doesn’t require an electrician as the control unit plugs into any 120v outlet. The control panel is designed for ease of use and not over complex. It is also certified by the National Sanitation Foundation. The 4 units in our salt chlorine generator reviews here have been giving good to great ratings on Amazon by the market. You can be confident that any of these units will serve their purpose well and are of great quality. For a discussion on inground pool chlorine generators, please read our article called Salt Water Chlorine Generators: All You Need To Know For Your Inground Pool.